Until the 21st century there was no material on the planet that could match the lofting and insulating qualities of goose down. People who were allergic to down and feather pillows were often made to deal with poor quality synthetics that either broke down too quickly or were to firm for their comfort level. When Primaloft ® was invented it was quite literally a miracle fabric. A 100% allergen free synthetic that mimicked down in every way and in some applications was more durable than down. Primaloft ® made better sleeping bags, coats, and most importantly pillows. Primaloft ® Down Alternative pillows have gained critical praise and acceptance with high end department stores such as Macys ® and even appeared in more than one five star hotel. What makes Primaloft ® Down Alternative pillows so sought after is unmatched comfortable paired with moderate support from a full fill of Primaloft ®. 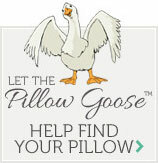 After one night on a Primaloft ® Down Alternative Pillow and you will never look at down the same way!